Following its recent performance in the Nigerian pharmaceutical industry, Fidson Healthcare Plc has emerged winner of the 2014 Nigerian Frost & Sullivan Award for Growth, Leadership and Excellence. The award ceremony held in the United Kingdom last month is in recognition of Fidson’s definitive vision and strong management, which stoked a growth rate of 26 per cent in 2013, acknowledging Fidson’s role in transforming the Nigerian Pharmaceutical industry. According to Frost & Sullivan Research Analyst, Danielle de la Mare, the Nigerian pharmaceutical market was estimated to be approximately US$1.19 billion in 2013, with year-on-year growth of 12 per cent. Fidson’s audited report for the same period shows revenue growth of 29 per cent from N7.2 billion in 2012 to N9.2 billion in 2013. Fidson grew its gross profit by 26 per cent, from N4.1 billion in 2012 to N5.1 billion to 2013, while it’s operating profit increased by 60 percent and operating margin by 3 per cent. Furthermore, Fidson is building a N7.5 billion biotech plant that will add a new product line, intravenous fluids, to its product portfolio, while doubling its production capabilities of existing product lines by 2015, thereby facilitating economies of scale. It will also enable Fidson to invert its manufacturing capacity and imports ratio from 40:60 to 60:40. Fidson is one of five local manufacturing companies shortlisted for the WHO Current Good Manufacturing Practices (CGMP) compliance. L-R: Corporate Finance Manager, Fidson Healthcare Plc, Mr. Imokha Ayebae; Senior Vice President, Global Sales, Frost & Sullivan, Mr. John Ruggles; Operations Director, Fidson, Mr. Abiola Adebayo and General Manager, Sales, Fidson, Mr. Abayomi Alli-Balogun during the Frost & Sullivan 2014 Growth Leadership and Excellence Award presentation in London, United Kingdom... recently. Fidson has also shown keenness in leveraging technology, as is evident in its use of security technologies in product packaging to combat the spread of counterfeit drugs. Each Fidson product has a branded sticker on it with a number that the consumer can text toll free to verify the authenticity of the product. The company estimates that it currently has a market share of approximately nine-10 percent, while its closest local competitors have nearly eight percent. If this growth rate can be sustained or enhanced when the biotech plant becomes functional, the company could well become a fierce regional competitor in the future. This is not the first time Fidson Healthcare is winning the Excellence award in the last one year. 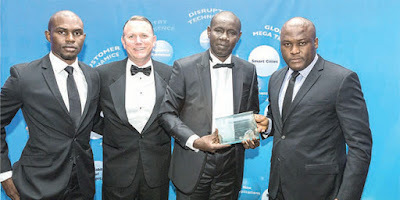 The Healthcare Company also won the award for ‘Nigerian Pharmaceutical Company of the Year’ at the Nigerian Healthcare Excellence Awards, organised by Global Health Project and Resources (GHPR) in collaboration with Anadach Group, USA, last year. 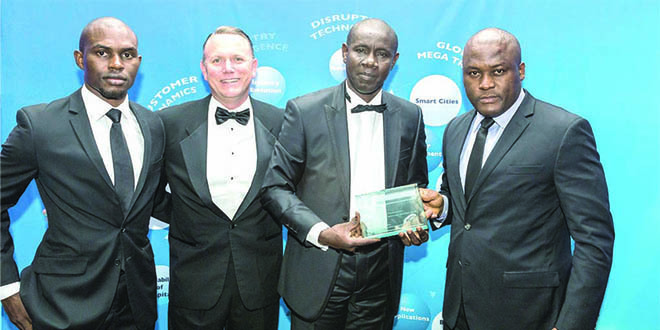 The award took place in March 2014 at the Eko Hotel & Suits, Lagos. It was organised to recognise and celebrate the best individual and organisation that have contributed remarkably to the Nigerian healthcare sector, as part of efforts to increase the visibility and successes of the industry. The Managing Director of Fidson Healthcare Plc, Dr Fidelis Ayebae, also emerged one of the top Chief Executive Officers of listed companies in Nigeria at this year’s edition of BusinessDay Top 25 CEO Awards for 2014 Financial Year. The Fidson boss had earlier emerged winner of the 2013 edition of the awards, following his company’s performance in the capital market and contributions to the country’s economy. Fidson enjoys a reputation of consistent profit record and value delivery to its shareholders and investors. Its recent revenue growth and 300 per cent Profit After Tax (PAT) in 2014 financial year lends credence to its growth sustainability. Frost & Sullivan, the Growth Partnership Company, works in collaboration with clients to leverage visionary innovation that addresses the global challenges and related growth opportunities that will make or break today’s market participants. It’s Best Practices Awards recognise companies in a variety of regional and global markets for outstanding achievements in areas such as leadership, technological innovation, customer service, and product development. Industry analysts compare market participants and measure performance through in-depth interviews, analysis and extensive secondary research. This story was published in Newswatch Times on June 20, 2015. Mrs. Chioma Adanma Umeha is a journalist of over two decades experience. At the moment, she is the Health Editor of Newswatch Times, Lagos, Nigeria. A graduate of Mass Communications from Anambra State University, Enugu, she also holds a Masters Degree in International Relations and Strategic Studies from the Lagos State University, Ojo, Lagos. 2017. Picture Window theme. Powered by Blogger.